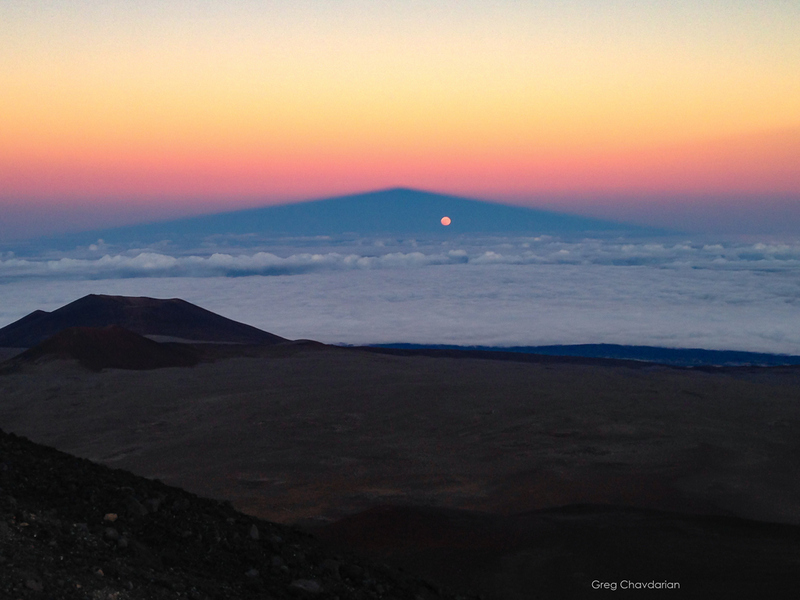 Explanation: On October 15, standing near the summit of Hawaii's Mauna Kea and looking away from a gorgeous sunset produced this magnificent snapshot of a Full Moon rising within the volcanic mountain's shadow. An alignment across the Solar System is captured in the stunning scene and seeming contradiction of bright Moon in dark shadow. The triangular appearance of a shadow cast by a mountain's irregular profile is normal. It's created by the perspective of the distant mountaintop view through the dense atmosphere. Rising as the Sun sets, the antisolar point or the point opposite the Sun is close to the perspective's vanishing point near the mountain shadow's peak. But extending in the antisolar direction, Earth's conical shadow is only a few lunar diameter's wide at the distance of the Moon. So October's Full Hunters Moon is still reflecting sunlight, seen through the mountain's atmospheric shadow but found too far from the antisolar point and the Earth's extended shadow to be eclipsed.